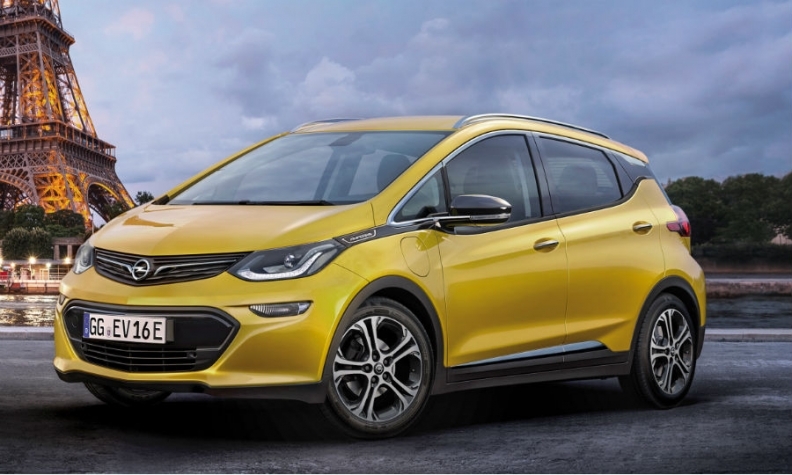 The Ampera-e is good for fast standing starts and highway cruising, Opel says..
FRANKFURT -- Opel says its Ampera-e hatchback, the brand's first full electric vehicle, will have acceleration and overtaking times equal to the performance of its sporty OPC models. The General Motors division will debut the car, a sister model to the Chevrolet Bolt, at the upcoming Paris auto show. The Ampera-e will have quick acceleration times, impressive overtaking ability, a roomy interior and best-in-class range, Opel said. The car delivers a "pure fun-to-drive" experience, Opel CEO Karl-Thomas Neumann said. "Electromobility in the future will be suitable for everyday use with the arrival of the Ampera-e," he said in a statement. The Ampera-e can accelerate to 50 kph (31 mph) from 0 in 3.2 seconds and to 120 kph from 80 kph in 4.5 seconds when overtaking on the highway, Opel said. Its top speed is 150 kph (93 mph). The EV's acceleration rates similar to those of cars from the OPC (Opel Performance Center) tuning division, the automaker said in the statement. The car's electric drivetrain produces 201 hp (150 kW) and 360 Newton-meters of torque (266 pounds-feet). An Opel spokesman said the comparison with the OPC models was not meant to imply the Ampera-e was a sporty car but to emphasize that its fun-to-drive performance since many customers were not looking for more than the thrill of an acceleration boost at a traffic light. The spokesman declined to provide details of the Ampera-e's range ahead of further announcements prior to the Paris show. In an interview with German business weekly WirtschaftsWoche, Opel marketing chief Tina Mueller said the Ampera-e would have a best-in-class range, exceeding the 320 km (200 miles) of the Bolt. The Ampera-e has its the battery pack mounted flat under the vehicle floor, helping to give it comfortable seating for five passengers and trunk space comparable with that of a compact car, Opel said. General Motors CEO Mary Barra said in February that Opel will start selling the Ampera-e next year. GM will start production of the Bolt at its plant in Orion near Detroit at the year-end. The Ampera-e is likely to be built on the same production line, although GM has not confirmed this. Sales of electric vehicles in Europe grew by 6.8 percent to 46,904 in the first half, according to JATO Dynamics researchers. The Renault Zoe was the top-selling EV with sales of 11,727, up 40 percent, followed by the Nissan Leaf with a volume of 10,727, up 25 percent and the Tesla Model S at No. 3 with sales of 6,719, down 9 percent.